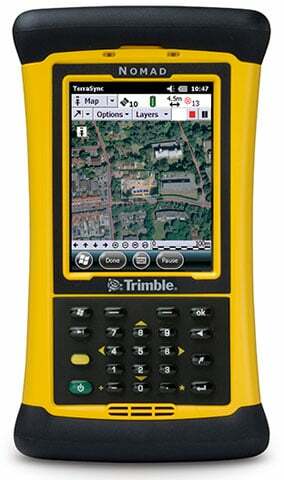 Trimble Nomad 1050X - YEL, Num, USB, Multi-Language. Interface Cables And Charging Cradle Sold Separately. The Trimble Nomad 1050 series is a family of proven, ultra-rugged, feature-packed GPS handhelds created for mobile GIS professionals carrying out field data collection and inspection activities in harsh environments. Engineered to provide you with a high-performance PDA-style data collector that targets outdoor use in extreme conditions and challenging locations, the Nomad 1050 handheld makes it easy to collect, maintain, save and transmit data in the field. If you work in remote forests, isolated wetland areas, desert regions or urban streets, you need the Nomad 1050, a handheld that works as hard as you do all day long, no matter where you go. The Trimble NMDXNY-111-00 is also known as NMDXNY-111-00	or NMDXNY11100	.